Perched on the Brooklyn waterfront overlooking the famous city skyline, just one stop from Manhattan, our South Studio offers the homey comfort of the borough's oldest neighborhood with all the conveniences of modern life. Staying with us will feel like having your own pied-a-terre on the top floor of a classic brownstone in historic Brooklyn Heights. Explore the quintessential American city, from the quintessential Brooklyn neighborhood. We are just steps from the Promenade, with a view of the New York Harbor, the Statue of Liberty, and the new Brooklyn Bridge Park. With one-stop access to Manhattan by virtually all subway lines, in addition to readily available taxis or a beautiful walk across the Brooklyn Bridge, you can explore both Brooklyn and Manhattan from this convenient and quaint neighborhood. We're as close to D.U.M.BO. as we are to the Financial District, without the noise and crowds of Manhattan streets. Our South Studio is also the perfect place for your short- or long-term business stay. Our spacious studio and free Wi-Fi make for a productive work environment. The many cafes and restaurants nearby are ideally suited to professional meetings of every kind. Our South Studio has a private entrance and comes equipped with a queen-sized bed and full-sized sleeper sofa, comfortable seating area, dining area/work station, free Wi-Fi, cable TV, efficiency kitchen with refrigerator, stove top, and microwave, MP3 player dock/clock radio, full bathroom, and lots of natural light. The proprietor lives on the premises, two floors down, and is available to address your queries or concerns. Brooklyn Heights offers fine dining, delicious treats, shopping, and daily necessities such as dry cleaners, cobblers, pharmacies, and supermarkets. This is my 4th stay at Pierrepont Studios, my first in the South studio . 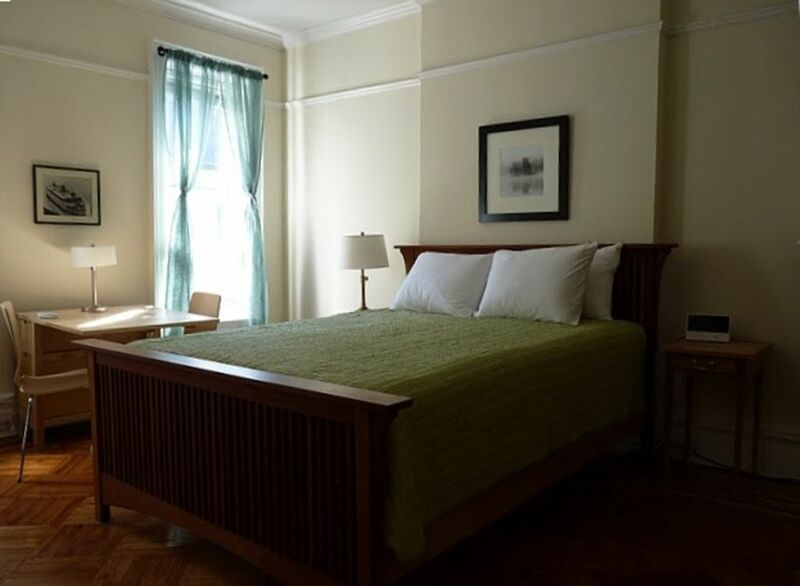 As usual it is just perfect for a peaceful stay in Brooklyn Heights. Down the Street from the promenade , near lots of restaurants and the subway. The studio itself is clean and Well-equipped on the top floor of a pretty townhouse. Charming apartment in a delightful location! Just returned from our week long visit to NYC! Loved staying in Brooklyn Heights and this apartment gave us a perfect NY feel. Quaint street & a quiet building - we sometimes wondered if anyone else was living there! This gave us more space than a hotel room for our family of 4. Beds were comfortable, arrangements were clean & well taken care of! It was nice to have some of the comforts of home! Howard was a gracious host & checked in with us to make sure all was well. The area is lovely & just a short walk (2 blocks) from 2 different subway stations! Getting to and from was very simple! At the end of the street is a beautiful view of lower Manhattan - a must see at the end of a long day!!! I would definitely stay here again!!! Neil H.Where do you live? Had a great time, we love staying here and will on our next NYC trip. Very comfy property. Loved the location and your restaurant suggestions. Bed and linens were so comfy too!